The Old Havana district in Cuba’s capital city is a maze of colorful cobblestone alleyways that date back to the 16th century. Still mostly residential, the streets are dotted with neighbors peering over their aging apartment balconies at the bustle below. Street vendors hawk farm fresh mangoes while groups of children play soccer and de facto mechanics work miracles to keep 1950’s American classic cars running without proper replacement parts. Standing tall at the entrance of Old Havana is Cuba’s majestic capitol building, known in Spanish as el capitolio. Many Americans who travel to Cuba for the first time remark that, with its large dome and white columns, el capitolio looks like a twin of the U.S. capitol building in Washington, D.C. Although 20th century U.S. and Cuban history are undeniably intertwined, Cuba’s capitolio is far from a replica of the U.S. capitol. It is rich with its own architectural gems and storied past that make it a must-see for anyone on a tour of Cuba. The massive structure, only slightly smaller than the U.S. capitol, was built in just three years, from 1926 to 1929, by 8,000 laborers. It was designed by Cuban architects, but it is said to have been inspired by the Pantheon in Paris and has its share of European elements, including 60 different types of marble, mostly from Italy and Germany. Two giant bronze statues by the Italian artist Angel Zanelli flank the entrance. One is a woman symbolizing a guardian of the people, and the other, a man representing work and progress. Zanelli contributed a third bronze statue, La República (“The Republic”), which was inspired by the Greek goddess Pallas Athena. La República, the third largest indoor statue in the world, towers over visitors directly beneath the capitol dome. At the foot of the statue sits one of the building’s most fascinating features – a replica of a 25-carat diamond that belonged to Nicholas II, the last tsar of Russia, encased in the floor. The original diamond once sat in its place, but was stolen in 1946. After it was recovered a few months later, it was locked in a safe at the Central Bank and replaced with the replica. Similarly to the Crypt in the U.S. Capitol that marks what was once the center of Washington, the diamond at the foot of La República was placed to mark Kilometer Zero of Cuba’s central highway. 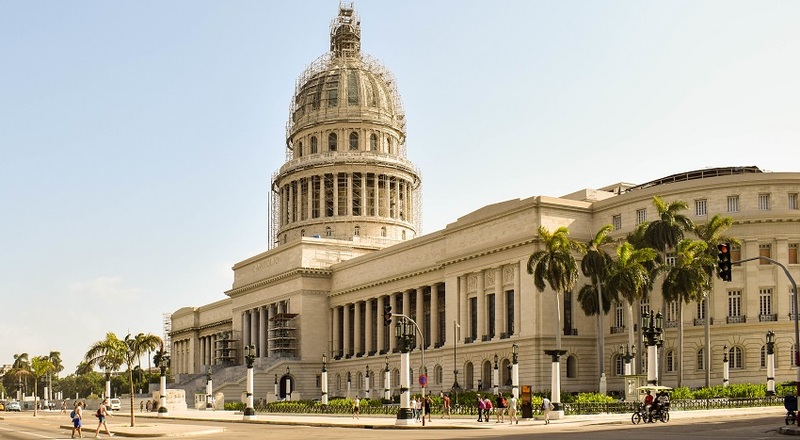 Like its counterpart in D.C., Havana’s capitol has separate chambers for both the Senate and House of Representatives. They are connected by a large, magnificent corridor known as the Hall of Lost Steps because of its acoustics. The corridor and chambers are breathtakingly ornate with flecked marble columns, gold-plated ceilings, and rich mahogany. Due to U.S. influence in Cuba during the first half of the 20th century, the local political system was structured similarly, and el capitolio was built to house Cuba’s congress. After the Cuban Revolution of 1959, it became home instead to the Cuban Academy of Sciences and other state institutions. But Cuba’s parliament now plans to return to its original home in el capitolio. Since 2010, the City Historian’s Office has undertaken the painstaking and expensive renovation of el capitolio as part of the greater transformation of Old Havana. Beyond the normal challenges of re-gilding the dome and statues to their original splendor, the renovations are slow-going because, due to the U.S. embargo, most materials are sent to Cuba from Western Europe and Mexico. Even though renovations are still ongoing, el capitolio remains open to visitors and makes for a spectacular stop on your tour of Havana. All renovations are scheduled to be completed by November 2019 to coincide with the 500th anniversary of Havana’s founding – which gives you plenty of time to start planning your trip to Cuba!